So, I was going to write about how the invitations are almost done, and how I am feeling a little more at ease after my “bridal breakdown” last Wednesday. Then I was going to tell you that unfortunately Mark bore the grunt of the breakdown, but luckily we survived and he still wants to married me. But none of that would be quite as interesting as the fact that in the ENTIRE city of Miami, Florida there are no $0.64 butterfly stamps! I drove around for two and a half hours today, visiting three United States Post Offices trying to purchase 130 $0.64 Monarch butterfly stamps. 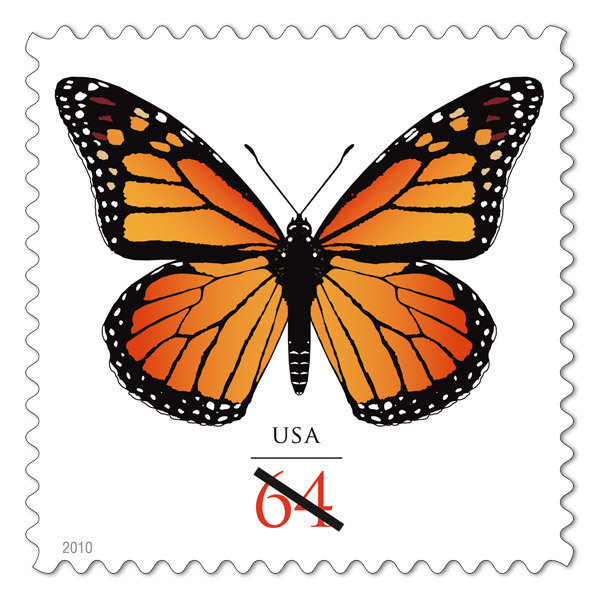 The same stamp that the Post office notes on their Web site that many cards that require additional postage will even have a generic outline of a butterfly on the card envelope to signify that you should go into your local United States Post Office and request a $0.64 butterfly stamp. … Unless of course you live in the Devil’s Armpit aka Miami, Fla.
My journey started out around 2 p.m. this afternoon when I stopped in the Coral Gables post office. I pulled into the park lot, put two quarters in the meter and … Are you kidding me?! The meter is broken. I growl, get back into my car and drive around the parking lot … again … looking for a spot. I wait for an old man in a scooter chair to (slowly) cross my path. I push on the gas, only to be stopped by a father with a newborn in a sling, slowly walking in front of my car as to not wake the sleeping baby. I finally screech into a space, throw my quarters into the machine and race into the post office, only to be foiled by a line and a one-eyed postal worker, who seems to be the only postal worker working. I sigh and take my spot in line. The lady two in front of me is finally called up. She wants stamps. One-eyed Jack hands her a sheet of cartoon stamps. “They are for work. Do you have anything less ridiculous? Nothing like these pansies in a basket. Yuck!” She complains. Pick some freaking stamps lady! I scream … in my head. “Do you have the Forever stamps?” she asks. “Ten-thousand stamps,” he corrects her. She buys one sheet of some “awareness” themed stamp. Finally it’s my turn. “Can I help you?” asked the one-eyed worker. “$0.64 stamps …” he says turning around toward the bin with the stamp packets in them. “ … Butterfly stamps,” I add. “We don’t have those,” he says. “Okay,” he says, staring at me with one eye. “Okay. … Bye,” I hesitate then turn to run out of the post office. I know there is a post office downtown, near my apartment. But of course the $400 GPS my wonderful fiancé bought me for Christmas died three weeks after I moved here in January. I have no clue where this post office is and there are some parts of Miami I am not going to just wandering about. So I call my mom, and ask her to look up post office locations. She finds the one on NW 2nd Avenue. I ask her to look up direction from my apartment, hoping to stop on my way home. “All it says is 220th Avenue,” she tells me. “Yeah! There’s no 220th Avenue downtown.” I tell her thanks and hang up, figuring I’ll just drive around looking for it. I drive up NE 2nd Avenue, figuring perhaps the north turns a bit away from the bay and will turn into NW. Right? That makes sense that a NE would turn into NW and vise versa. But we’re in Miami. After driving around for a bit, I pull out the map application on my phone. Of course, NW 2nd Avenue is an ENTIRELY different street. I drive around looking for a post office. You know, a place that has a red and blue sign that says “United States Post Office?” Or maybe one with an eagle? Apparently this post office is a windowless concrete building, with United States Post Office carved into a rock. I enter the dark building, and take my place in a longer line. Though this one seems to be moving faster and the post office is bigger. It’s promising. “Next!” The postal worker calls. “No,” she says, without even looking at me. “Do you know who would? I mean do you even have them in the stores or just online?” I ask. She gives me directions to the Biscayne Boulevard post office, promising they have everything. I drive around looking for the building and a parking space. I find the building but realize there is no parking. I decided to go back to my apartment, take in my groceries and then walk to the post office. As I get out of my car, I start sobbing uncontrollably. Yes, I still have my health, a roof over my head, my family and my dog. But really? How difficult is it to buy stamps? It’s unexplainable. And that’s what is upsetting and unnerving. I pull myself together enough to get through my building’s lobby. Once I step into the elevator, the tears are released again. When I walked into my apartment, my dog, who, like most men, doesn’t do crying girls very well, takes one look at me and runs back into his cage. Once again I pull myself together and walk to the post office. I walk into an office building where it’s supposedly located. There’s no directory. I spot two blonde girls hoping one of them speaks English. “Excuse? Is there a post office in here?” I ask. “Uh, no ...” she says with a French accent. Close enough. She gives me directions. On the side of the building, in a little storefront sits a post office. Way tiny. Like shoe box tiny. My hopes sink. A postal work comes up behind me. I asked for the stamps. She looks for them. All they have are the dolphin, she tells me. I ask for $0.44 lighthouse-themed stamps. She looks at a makeshift stand with sheets of various stamps hanging on it. Then she looks in the back. No, she tells me. I ask if this stand represents the stamps they do have. She says yes. I sigh and grab the ones that that sort of look like the king and queen on playing cards. “140,” I say. I don’t even care. I walk back home. I’ll be able to finish the invitations, and hope to stop by the post office near my school tomorrow to pick up the outer envelope stamps. As proud as I am on how the invites turned out, I can honestly say I will be ESTATIC to send them on their way. And maybe having “green” invites (those that are emailed), are not only environmentally friendly, but also psychologically friendly. Perhaps that’s why hippies are so happy. You're a great story teller! I am both laughing and crying for you... It will feel so good to send the invites out and start getting replies! Good luck! I agree, you write beautifully I do enjoy reading about your Wedding Planning experience. Although it makes me very sad we are unable to make it I send you virtual hugs in the hope that in some small way it helps.